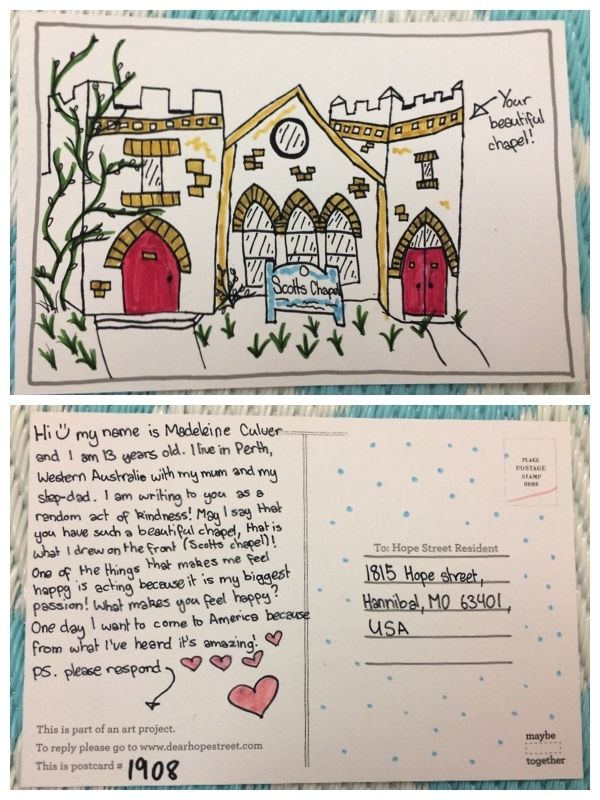 Hi Madeline, I do not live on Hope Street but I do go to this church. We were very impressed with your drawing of our church and as the children’s Sunday school teacher I thought we would reply to you. Our class ranges in ages from 5 to 16 so we divide up and do things age appropriate for each group. I do have a 9 year old grandson son (he lives in Texas) that loves to draw and he liked your drawing. We hope that at some time you are able to visit America and when you do we hope you can stop by and see the little church on the corner with the big heart, where a stranger meets a friend, and God meets us all. Again thank you for your drawing.